An author’s degree of contribution to a study can sometimes be identified by the order in which the names appear in the byline of the publication, but it is often difficult to precisely discern relative contributions that way. The Contributor Roles Taxonomy (CRediT) aims to solve this problem by identifying levels of author contribution using a series of predefined roles, such as “Conceptualization,” “Data Curation,” “Writing,” and more. 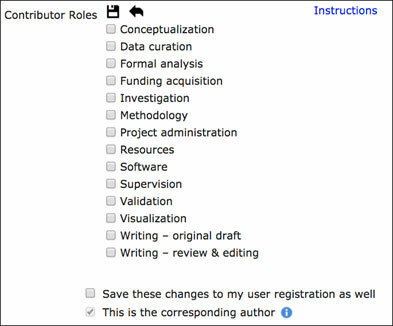 In Editorial Manager, journals have the option to request, or even require, authors to designate CRediT contributor roles during manuscript submission. This article examines the use of CRediT by The Journal of Bone and Joint Surgery (JBJS) and the impact it has had on its authors and journals. CRediT is a taxonomy used to identify specific contributions to published scholarly works. Prior to CRediT’s inception, author contributions could be loosely discerned based on name order, but this method lacked transparency and granularity. Research funders and authors alike were in need of a way to consistently identify contributor roles in a way that reflected the modern levels of research contribution. 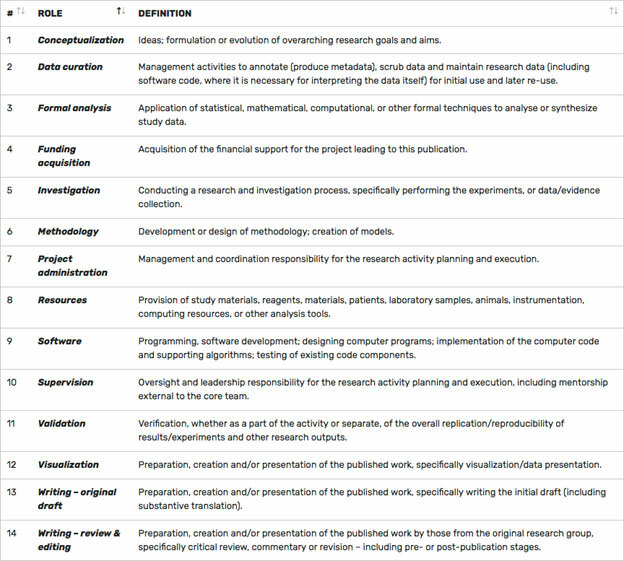 Following a joint workshop between Harvard University and the Wellcome Trust and a pilot led by Cell Press’s Gabriel Harp, 14 contributor roles were identified and finalized to create the taxonomy. CRediT was integrated into Editorial Manager in 2016, allowing journals to request or require contributor roles as part of submission. Corresponding authors select degrees of contribution for all authors, and co-authors are able to confirm their participation. JBJS was among the first to fully implement CRediT in Editorial Manager. 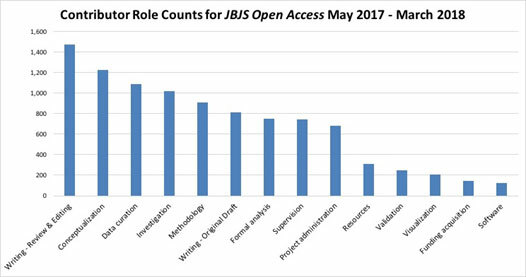 “We did a soft launch in July 2017 by enabling contributor roles as an optional field for authors submitting papers to JBJS and JBJS Open Access only,” said Christina Nelson, Editorial Operations Manager of JBJS, Inc. In January 2018, JBJS began requiring CrediT as part of submission for all six JBJS, Inc. journals (JBJS, JBJS Essential Surgical Techniques, JBJS Case Connector, JBJS Reviews, JBJS Open Access, and JBJS Journal of Orthopaedics for Physician Assistants). JBJS’s use of the taxonomy provides a unique opportunity to examine how CRediT roles are being used. 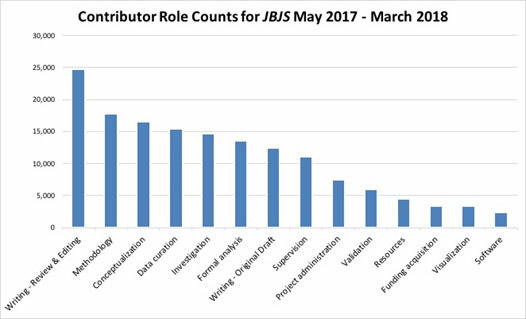 For example, examining author submissions to JBJS from May 2017 through March 2018 shows “Writing – Review and Editing” as the most listed contributor role, with “Methodology” following as second most listed. 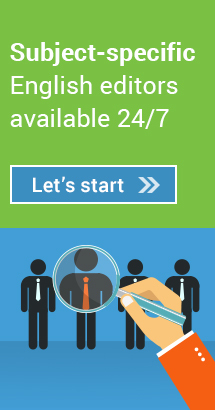 “Software” was the least mentioned role. Counts for JBJS Open Access reflect similar patterns. Now, having implemented CRediT fully for all six journals, JBJS, Inc. plans to look more closely at CRediT’s value for readers going forward. “As this is currently an author and editor-facing feature, we hope to turn it more towards the reader in the future by publishing contributor roles alongside the final articles upon publication,” said Nelson. Aries Systems Corporation. Editorial Manager CRediT Integration. 2017. www.ariessys.com/wp-content/uploads/CRediT-FAQ_8.5x11.pdf. Aries Systems Corporation. Implementing CRediT: An interview with Cell Press’s Gabriel Harp. 2016. www.ariessys.com/views-press/news-opinion/implementing-credit-an-interview-with-cell-presss-gabriel-harp. Harvard University. Report on the International Workshop on Contributorship and Scholarly Attribution. 2012. http://projects.iq.harvard.edu/files/attribution_workshop/files/iwcsa_report_final_18sept12.pdf.